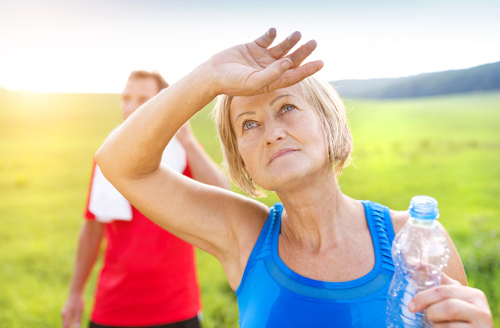 With summer temperatures spiking throughout America, the heat can be a real deterrent to outdoor exercise. Exertion is tough, not to mention risky, in hot temperatures. Nausea, heat stroke, and general discomfort are all risks when you head outside for a hot-weather workout in the summer. Past research has indicated that cooling the body directly before heading out for a run, bike ride, or other activity can improve performance and make the heat more bearable. Other research has shown that acclimating your body to warmth before an outdoor, hot-weather workout session could also help with high temperatures. But how do you know which method to choose? According to a recent study comparing the two, heat acclimation can produce better results. But, it takes a little more time and planning. This technique is performed over the course of days or weeks. And it generally involves simply spending more time outdoors being active in hot weather, but at lower intensities and durations than normal. So, if you’re used to running outside every day, slow that run down to a jog or walk and go for a shorter time period. If you play soccer a couple of times per week, don’t play at max effort for a few games. And, spend a little more time outdoors and active on the hot days you’re not playing. You can also sit in a hot bath for 30 minutes following outdoor activity to acclimate yourself to warmer temperatures and amplify heat adaptations. Although it is time consuming, as the days and weeks go on, you should notice the heat plays less of a factor in your performance and comfort. If you don’t have the time or you’re unprepared for the sudden spike in heat one day, you can try the cooling method instead. Cool yourself about 20 minutes before you go out. Icing your skin and drinking cold beverages can help bring your body temperature down, so it’s more responsive to heat. No matter which method you use, staying hydrated is essential to keeping your body functional when you’re out in the heat. And it’s especially important when performing exercise. Make sure you’re drinking plenty of water and, when performing intense exercise, sports drinks rich in electrolytes. It should also be noted that although the heating and cooling methods can help improve performance and acclimate your body to heat, they do not eliminate the risk of heat stroke or other serious heat-related discomfort. So, remember to exercise with care this summer! What’s the Difference Between Heat Stroke and Heat Exhaustion? Reynolds, G., “Hot Weather Workout? Try a Hot Bath Beforehand,” The New York Times, June 14, 2017; https://www.nytimes.com/2017/06/14/well/move/hot-weather-workout-try-a-hot-bath-beforehand.html?_r=0, last accessed July 4, 2017.